A new code of practice (DHF TS 012:2018) designed to raise standards of safety in the industrial door industry has been announced by Tamworth-based trade association, the Door and Hardware Federation (DHF). 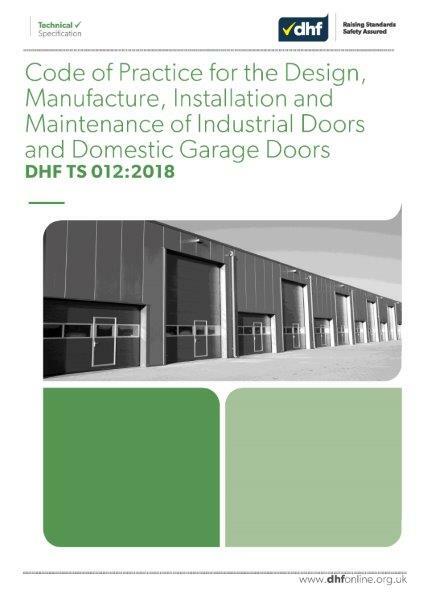 The Code of Practice for the Design, Manufacture, Installation and Maintenance of Industrial Doors and Domestic Garage Doors (DHF TS 012:2018) is the 13th in a series of DHF technical specifications covering the range of industry sectors represented by DHF and is available as a free download from www.dhfonline.org.uk. Providing a framework to ensure the safe and compliant installation of industrial doors and roller shutters, the code draws on safety legislation, European standards, and industry best practice. It gives practical help to all those involved with industrial doors by providing clear guidance on their legal obligation and responsibilities. The code took more than nine months to develop and going forward, will form the basis of the DHF comprehensive two-day Industrial Door Safety Diploma course. The DHF’s Industrial Door Group now represents more than 273 UK manufacturers, suppliers, installers or maintainers of industrial doors and industrial door equipment. The Code of Practice DHF TS 012:2018 is available now from the dhf website. Email the DHF on info@dhfonline.org.uk or telephone 01827 52337 for further information.